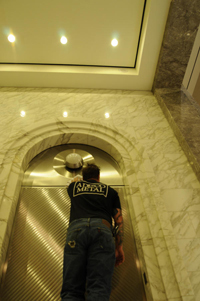 The basics of marble refinishing has not changed in the last 100 years. Marble is cleaned, sanded with a series of abrasives, and then burnished with a mixture of oxalic acid and tin oxide until a desired polish is achieved. What has changed is how fast and efficient this work can be performed. As recently as 50 years ago, it was done almost entirely by hand. Armed with a handful of sandpaper, a damp towel, and eight hours of elbow grease, a marble polisher could polish an area the size of a typical desktop. Today, in the same amount of time, a marble technician can produce 40 to 50 times that quantity. We at ADDCO METAL are constantly researching new technologies that help us produce the quality workmanship our clients expect, at levels of efficiency that the marketplace demands. Recently, that research led us to new methods and equipment that has increased the amount of marble we polish in an eight hour period by 15%. Call us if you interested in what our customers have come to expect- superior workmanship at competitive prices. 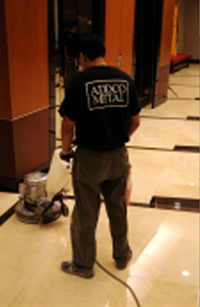 Please contact us if you wish to join the ADDCO team!